An infestation of woodworm can be very damaging to the structure of a building and also the wood within office and home furniture. Our Local Surrey woodworm treatment and woodworm pest control services will eradicate the problem. Call us on 01483 200 727 for woodworm treatment and woodworm control by a local company in Surrey. Call us on 01483 200 727 for your LOCAL pest controllers who will remove your woodworm infestation in Surrey or West Sussex. 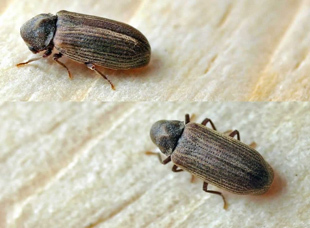 Woodworm is the larvae of a wood boring insect that drills its way through all types of wood that is joined together or even touching each other. Woodworm is a collective name for the family of wood boring insects so covers a variety of species. 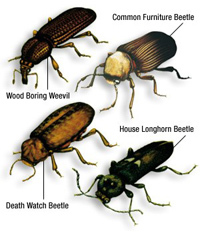 Insects in this family include the Deathwatch Beetle or the Common Furniture Beetle. At larval stage of the insects’ life they bore and eat the wood in which they reside. This is where the term ‘Woodworm’ comes from. A woodworm infestation can seriously weaken timber beams and load bearing structures in your property leading to the eventual failure of the building if the woodworm are not dealt with. CPC is a member of Checkatrade and fully insured. All technicians fully trained by the British Pest Control Association to level 2. If you wish to allow cookies, remove this message and continue using our website then CLICK HERE TO AGREE TO COOKIE USE.